This Blackforest Cake was gigantic and still moist and packed full of flavour. 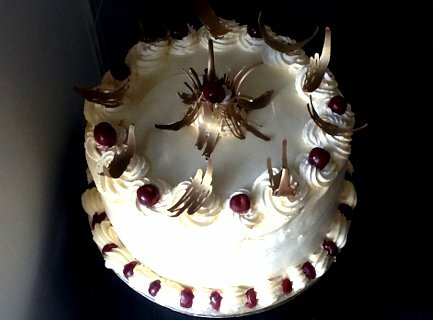 Soft chocolate sponge layered with whole cherries, chocolate, and freshly whipped cream.It was sprayed with edible gold luster spray which added a beautiful metallic sheen and the chocolate curls the same. Add some luxury for a special person.